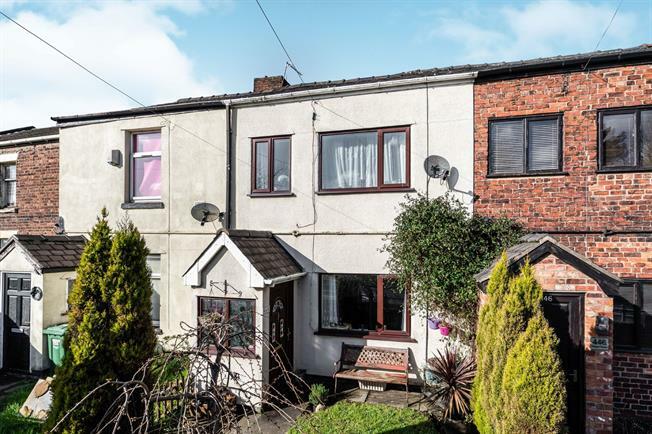 3 Bedroom Terraced House For Sale in Bolton for Offers Over £115,000. WONDERFUL CHARACTER PROPERTY WITH GORGEOUS VIEWS COUNTRY STYLE FEATURE FIREPLACE, WOODEN BEAMS & THREE BEDROOMS. Constructed in approximately 1838, the property boasts lounge with white beams and feature fireplace, kitchen diner with a cosy feel and views to the garden. There is scope to finish the loft space which has been boarded out and has spotlights and beams. There are two generous double bedrooms and a good sized single. Scope for parking in garden which has a raised area with gravel. . Storage area under stairs and route through to kitchen. Radiator, laminate flooring, shelving, ceiling light. Roll top work surface, wall and base units, one and a half bowl sink and with mixer tap with drainer, space for oven, space for hob. Radiator, tiled flooring, built-in storage cupboard, part tiled walls, ceiling light. Low level WC, jacuzzi, shower over bath, bowl sink. Loft area with spotlights, carpeting and built in cupboards. Opportunity to convert into a fourth bedroom with the addition of a stairwell.